There is an ancient Arab proverb that says, "The enemy of my enemy is my friend." Its meaning is essentially self-explanatory. In the modern world, the phrase can describe the relationship among seemingly disparate people or groups who share a common adversary. It is no surprise that Islamist organizations in the United States espouse support for foreign Islamic terrorist organizations and denounce virtually every US counter-terrorism effort. Such organizations viciously attack Israel and often Jews when issues related to Israeli defense measures against terror attacks come into play. Hamas, Palestinian Islamic Jihad (PIJ) and other Palestinian terror organizations can unleash lethal attacks against Israelis and Jews and nearly any Israeli response will be condemned as a "war crime" against the Palestinian people. A disturbing trend is emerging in America. Those radical Islamists are finding new allies among a number of extreme leftist groups. One example of this is the coalition found in "Viva Palestina USA." Viva Palestina USA is an offshoot of British MP George Galloway's anti-Zionist, pro-Hamas Viva Palestina convoy initiative that has conducted supposed humanitarian aid trips into Gaza, including last month's trip with about 200 Americans as well as more than $1 million in aid for Palestinians in Gaza. Viva Palestina USA claims to be a humanitarian initiative desiring to help needy Palestinians. A previous report by the Investigative Project on Terrorism shows convoy organizers exhibiting clear anti-American, anti-Israel, revolutionary and pro-Hamas sentiments. Viva Palestina USA is not (yet) an IRS-approved tax exempt non-profit organization. Its website solicits donations through an organization called the Interreligious Foundation for Community Organizations/Pastors for Peace (IFCO). The IFCO is a tax exempt non-profit organization based in New York City. The executive director of IFCO is Lucius Walker, Jr. Walker is a Baptist minister who was a founding director of IFCO/Pastors for Peace. IFCO and Walker are also involved with an organization called "Cuba Solidarity," also known as the "National Network on Cuba (NNOC)." IFCO is listed as an affiliate organization on the Cuba Solidarity website. Cuba Solidarity and the NNOC are pro-communist Cuba and oppose US Government policies against Cuba. Walker has been involved in several "aid caravans" to Cuba in violation of the US trade embargo. "...But we could not avoid being a part of this historic effort to give the people of the United States an opportunity to visibly demonstrate their opposition to our government's policies, our government's callousness and our government's complicity with Israel's efforts to destroy the hopes and the aspirations of the Palestinian people. And so we have been honored to be able to receive funds on behalf of this effort that we are here as a part of. So this is the second send-off that those of us connected with Pastors of Peace have been a part of for this week..." and "Fidel [Castro] was right, is right. A better world is possible. But that better world is not possible if we do not take bold and courageous and determined action." "I also want to say as we continue to struggle for liberation for people all over, and we are particularly concerned about Africa we want to thank the New Black Panther Party. Please y'all stand up..."
Anti-Israel, leftist Christian and pro-communist political groups are not the only ones aligning themselves with radical Islamists. There appears to be a growing movement among radical Latino and African-American groups to support jihadists. The Aztlan movement, or "Movimiento Estudiantil Chicano de Aztlan," or "Chicano Student Movement of Aztlan" touts the supremacy of Latino culture and hopes to eventually return the southwest states of the US to Mexico, claiming those states were illegally procured from Mexico. This is, essentially, a Latino separatist and secessionist movement. The "Aztlan Communications Network," also known as "La Voz de Aztlan" (The Voice of Aztlan) claims it is a "totally independent news service." This website, however, in its "Quest for Aztlan" section carries an emblem that is nearly identical to the emblem found on the official MEChA site. The "Historical Documents" section identifies "El Plan de Santa Barbara," as does the MEChA site under its "Documentos" section. Also identified in this La Voz de Aztlan section are detailed references to MEChA. "We were all moved to tears of grief and anger when Israel launched its murderous bombardment against the people of Gaza in December and January." "While the bombs were still showering down on what has been called the largest open-air prison in history..."
"The US has a chance right now to step into a more progressive role in the world. But Viva Palestina USA needs your help to make this venture successful and to get this aid through the siege that has been strangling the people of Gaza for three years." "1) Circulate this message among all friends, community and religious groups and other organizations in your network. Publish it on your website if possible. MEChA Chapters are encouraged to participate." "2) ...Donations are being handled by the Interreligious Foundation for Community Organization and should be made payable to Viva Palestina – IFCO. Please write on your donation "Aztlan Delegation." For information on how to make a donation click Donate." "3) Come as an Aztlan delegate to Gaza..."
"4) Hold a fundraiser in your city or community. We have films and other materials to assist you. E-mail Aztlan.Gaza.Delegation@aztlan.net for further information." "5) Contact your local and state media to tell them why you support the Viva Palestina USA convoy." "Together, we WILL break the siege, we WILL deliver much-needed aid to the people of Gaza, and we WILL help free Palestine! VIVA, VIVA PALESTINA!" Israel has now massacred over 300 Palestinian children in Gaza . "According to United Nations reports, the Zionist state of Israel has now slaughtered over 900 Palestinian civilians in the Gaza Strip since December 27, 2008 when the indiscriminate bombing of Palestinian homes, schools and mosques began. Most shocking is that more than 300 of these are babies, toddlers and young children (1500 injured). This war crime has got to be one of the most horrific in the history of humanity." A curious YouTube video posting also reflects the emerging paradigm of an extremist American affinity for the Islamist cause. The segment is a 4+ minute rap video slide show called "My Enemy's Enemy" by something called M-Team. Prime repetitive wording in the rap is "My enemy's enemy is my man, my man." The slide show intersperses scenes from the Middle East with 1960s-era shots of armed Black Panthers and Black Liberation Army operatives as well as what appears to be some photo reference to the Nation of Islam and the capture of Latino illegal aliens by the US Border Patrol. 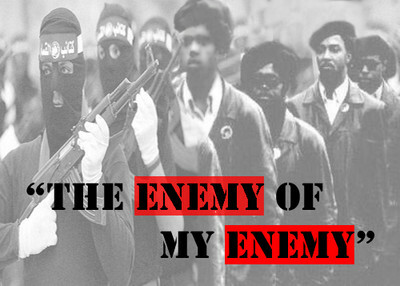 "My Enemy's Enemy" was used to open the July 26 broadcast of "The Crescent Report," a weekly program hosted by Muslim American Society (MAS) Freedom Foundation officials Mahdi Bray and Ibrahim Ramey. MAS was created by the Muslim Brotherhood, which federal prosecutors describe as "a generally covert organization whose credo is 'Allah is our goal: the Qur'an is our constitution: the Prophiet is our leader: Struggle is our way: and death in the path of Allah is our highest aspiration.'" "We're sharks in the water, we work for the man. My enemy's enemy is my man, my man. You smuggle contraband or you cross the land, my enemy's enemy is my man, my man. I'm a brother to the (unintelligible word) with stones in their hands, Palestinians fighting for their stolen land…Got brothers from the Vietnam. Not the red, white and blue, but the Viet Cong." Afterward, co-host Ibrahim Ramey even dedicated the song to a listener. Islamists are garnering support from disparate sources. Radical non-Muslim ethnic groups and hard-core leftists seem to be jumping on the jihadist bandwagon. It's an alliance that demands closer inquiry.